Her elaborate, star-studded baby shower in New York cost a reputed £350,000 and sparked a furious debate about its ‘Marie Antoinette-style’ decadence. But rather than being put off by the criticism, the defiant Duchess of Sussex is planning a second celebration of her pregnancy – albeit on a much more modest scale. A handful of Meghan’s most intimate friends, including Victoria Beckham, are expected to attend and the Duchess’s mother Doria will fly in from LA. Meghan planned to host the event at Frogmore Cottage at Windsor where she and Prince Harry are setting up home. But renovation work has been delayed, meaning the party could be moved to Buckingham Palace. In February, Meghan provoked an outcry when she flew by private jet to the US for a five-day baby shower celebration. Around 20 friends attended, including Serena Williams and Amal Clooney. They partied at The Mark hotel in Manhattan, in one of the world’s most expensive suites. Markle spent the morning before her baby shower gallivanting around town with former Suits co-star Abigail Spencer, tennis great Serena Williams, designer Misha Nonoo and Canadian gal pal Jessica Mulroney. 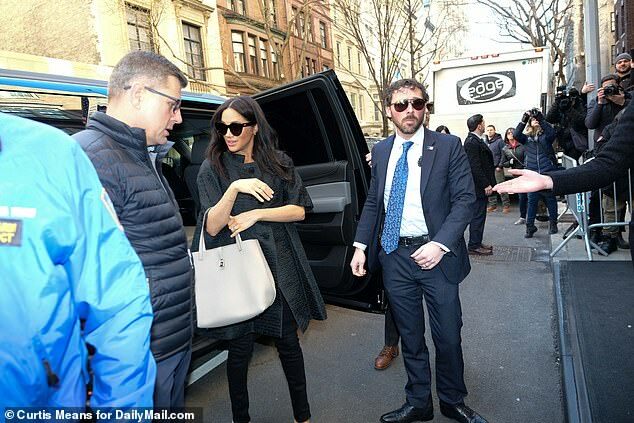 Markle and Spencer grabbed lunch together before being joined by the rest of the group for dinner at The Polo Bar, the swank New York eatery owned by designer Ralph Lauren. Then, on the day of, she welcomed even newer friends to her party at The Mark, including human rights lawyer Amal Clooney and King, who scored an invitation despite being kept off the guest list at Markle’s wedding. Her mother’s absence also meant that Markle had not one family member at the party, including new sister-in-law Kate Middleton, though baby showers have never been a British tradition. Princess Beatrice, who works in New York as the Vice President of Partnerships and Strategy at the software company Afiniti, was also not in attendance. It was similar in many ways to her wedding last May, where it was Prince Charles who was tasked with walking Markle down the aisle as the relationship between the Duchess of Sussex and her father became increasingly fraught. The shower was hosted by Serena Williams, Jessica Mulroney and Genevieve Hillis, who has been Markle’s best friend since the age of 17 when they met at Northwestern. ‘It was a small, private affair, and a special time for her,’ said CBS presenter, Gayle King. While Markle was being feted by her newfound celebrity pals and recent co-stars at The Mark in New York City, her mother was seen walking alone in Los Angeles. A video, which emerged on social media after the shower, appeared to give a glimpse of the very lavish set up. Royal fan account harry_meghan_updates, run by Instagram user Francesca, shared a video on its Story, claiming that the short clip was actually captured inside the star-studded baby shower. It captures the dessert buffet on offer to guests which was designed by illustrator Darcy Miller, and featured four macaron towers from Laduree, which cost a total of $460. 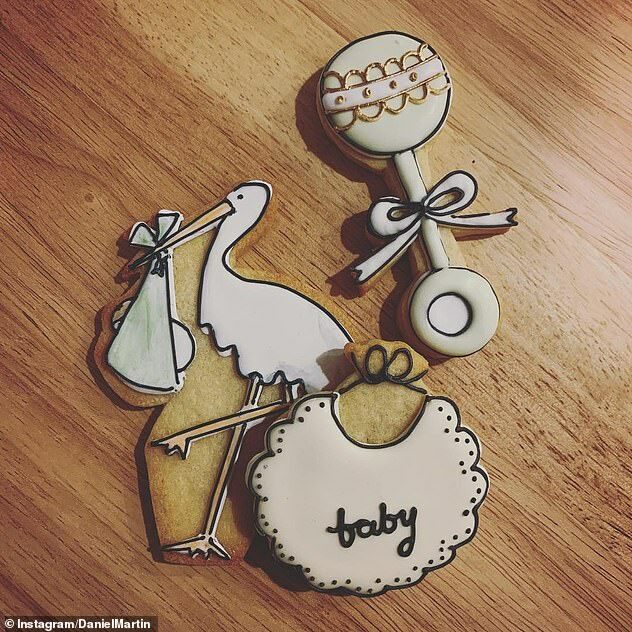 Also seen among the tempting treats captured in the video are the iced baby-themed cookies, as shared by Meghan’s makeup artist Daniel Martin shared on his own Instagram earlier this week. The Duchess’ close pals were also treated to stork-shaped cake pops and miniature slices of carrot cake, as well as multiple cupcakes iced in pink and green frosting. The crowing glory was a two tiered cake which featured a miniature paper cut out of Harry and Meghan stood next to a pram – believed to be the work of event designer Darcy Miller, who has been credited with putting together the lavish dessert buffet at the event. The 37-year-old royal’s lavish baby shower took place during her $503,000 trip to New York City in February. Decorations for the exclusive party began arriving on Tuesday, and there was plenty of pink — from the blush-colored roses to the cotton candy machine that was brought into the hotel. 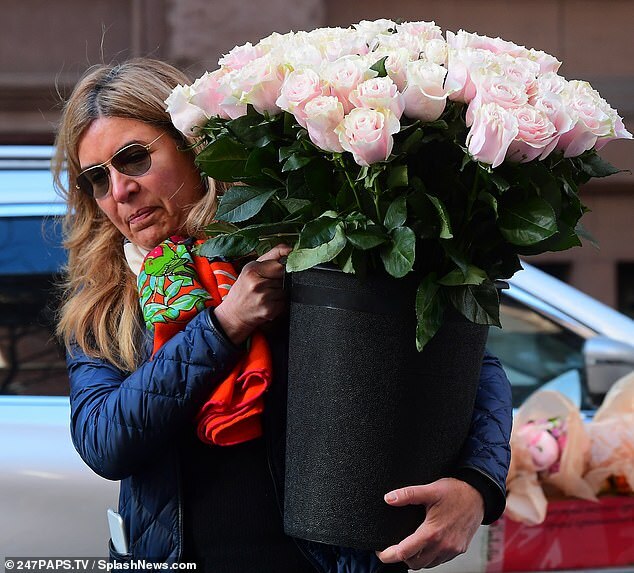 Dozens of light-pink long-stem roses worth close to $400 were seen being carried into the venue on Tuesday by Upper East Side florist Lady Fleur, and those weren’t the only floral arrangements of that color to be seen. Another rack of flowers that was being wheeled into The Mark featured rows of bouquets, many of which were pink or orange. Many of the guests carried white bags and presents, including newly-engaged designer Misha Nonoo, who is credited with introducing Meghan and Prince Harry. Upon her arrival, she was seen carrying a large white bag from high-end interiors company Rani Arabella into the hotel. Fitness trainer Taryn Toomey, the creator of a celebrity-loved workout called The Class, arrived at the event carrying two large white bags and a large sports bag. While the party decor suggests that Meghan may be having a girl, it’s also possible that she and Prince Harry are waiting until the day their royal baby is born to find out the gender. Earlier this month, the Duchess of Sussex was captured talking to a guest about her unborn child at the Endeavor Awards. Royal commentator Victoria Arbiter recently stated that it is ‘royal philosophy’ to keep the baby’s gender a secret until the day of the birth. Meghan, 37, will not carry out any more official engagements until she gives birth – the baby is due next month.